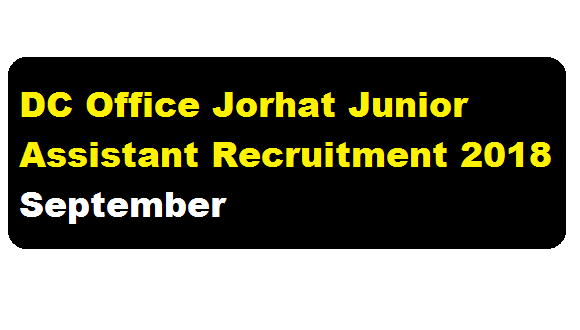 DC Office Jorhat Recruitment 2018 September – Junior Assistant Post : Office of the Deputy Commissioner Jorhat has published a vacancy notification in September 2018. In pursuance of Govt. Letter No. GAG(B)32/2015/163 dated 7.07.2018 online applications are invited in Standard Form as Published in Assam Gazette in Part- IX from the citizen of India as defined in Articles 5 & 8 of the Constitution of India for filling up of the following sanctioned vacant post of Junior Assistant in Amalgamated Establishment of Deputy Commissioner Jorhat in the pay Bands & Grade pay with other allowances as per admissible Rule as shown below. Online form may be filled up w.e.f. 20th September to 3rd October, 2018 till 5.00 PM at www.dcofficejorhat.in. The application will not be accepted after expiry of the given time as the link will be disabled. In this section, we will discuss in details about the recruitment of Junior Assistant Post under DC Office Jorhat Recruitment 2018 September with vacancy details, eligibility criteria, salary with other details and requirement. Educational Qualification: (a) For the post of Junior Assistant the minimum educational qualification of the candidates shall be a Graduate in Art, Science or Commerce from a University recognized by the State Government or a Degree equivalent thereof and recognized by the Government. (b) Candidates must have proficiency on basic Computer application like MS Windows, Linux, Mac Excel, Power Point, DTP( English/Assamese) and internet etc. Candidates must possess a minimum 6 (six) months Diploma in Computer application from Institute recognized by the Government. Age Limit : As per O.M No. ABP-06/2016/08 dated 18.04.2018 candidates must not be less than 18 years of age or more than 44 years of age as on 01.01.2018. The upper age is relaxable by 5 years in case of SC/ST and persons with Disabilities and 3 years in case of OBC/MOBC. (a) Candidates applying for the post of Junior Assistant will have to appear in a written test as per Govt. notification No. GAG(B)469/2016/36, dtd. 15th March, 2017 of 150 marks comprising General English (75 marks), General Knowledge (50 marks), Quantitative Aptitude (25 marks) Computer theory (50 marks), Language Skills (50 marks- Assamese/Bengali/Bodo/Alternative English). Only the shortlisted candidates will have to appear in a Computer proficiency test (50 marks). (a) Candidates are required to apply in prescribed form through Online Mode only. No other mode for submission of application is allowed. The application form will be available Online. (c) Before applying online, candidates are advised to carefully go through the instructions provided in the above website. (d) Candidates are required to upload latest passport size photograph, Admit Card/Passed Certificate & Mark Sheet of HSLC examination certificate & Mark Sheet of Graduation, Computer Proficiency Certificate, Caste Ceritificate, Medical Certificate (Hearing, Impaired). (e) Since the applications are submitted online, the question of submission of applications through proper channel in case of the candidates already employed becomes, redundant. However such candidates shall obtain No Objection Certificate (NOC) from appropriate appointing authorities to appear in the said examination. f) After the Computer Proficiency test candidates will have to bring all original testimonials i.e. Age proof Certificate, Caste Certificate, Educational qualification Ceritifcate, Computer Proficiency Certificate, Mark Sheet for documents verification when called for. 1. The selected candidates will have to submit an undertaking to the appropriate Authority that they will abide by new persion Rules of the Govt. issued vide Finance Department’s Letter No. OM No. BW.7/2008/Pt/40 dtd. 06.10.2009. 2. All appointments will be made after police verification and medical test as procedure in case any candidates fails to qualify these tests then his/her candidature will be cancelled and will not be considered for appointment. 4. Candidates should be well versed in state official language. 5. Canvassing directly or indirectly in any form will disqualify the candidature of the candidate. 8. No TA/DA will be admissible for appearing in the Test/Computer Proficiency test.